The Get Up Kids were formed in Kansas City, Missouri, in the mid-1990s and released their debut album, Four Minute Mile, in 1997. They went on to become one of the torchbearers of the late ’90s “emo” movement. But unlike Jimmy Eat World, who broke out in a big way in 2002, GUK never really achieved what I would consider mainstream success outside of the emo realm. The band broke up in 2005 with the members going on to pursue other projects (The New Amsterdams, Koufax, Blackpool Lights, Reggie and the Full Effect) but they got back together in 2009. 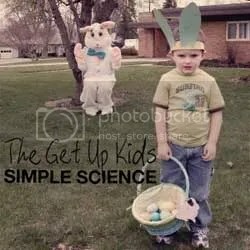 Simple Science is their first new studio recording in six years (the last being 2005’s The Guilt Show). With four songs clocking in at just over 16 minutes, it almost feels like they are testing the waters first before jumping in and releasing a new album. The music also feels like it’s testing the waters. Not enough energy to really get into and not enough emotion to actually sit back and listen. Sounds very middle-of-the-road to me. This entry was posted on June 24, 2010 at 12:00 pm and filed under TheSlacker. You can follow any responses to this entry through the RSS feed.